Sew what's cooking with Joan! 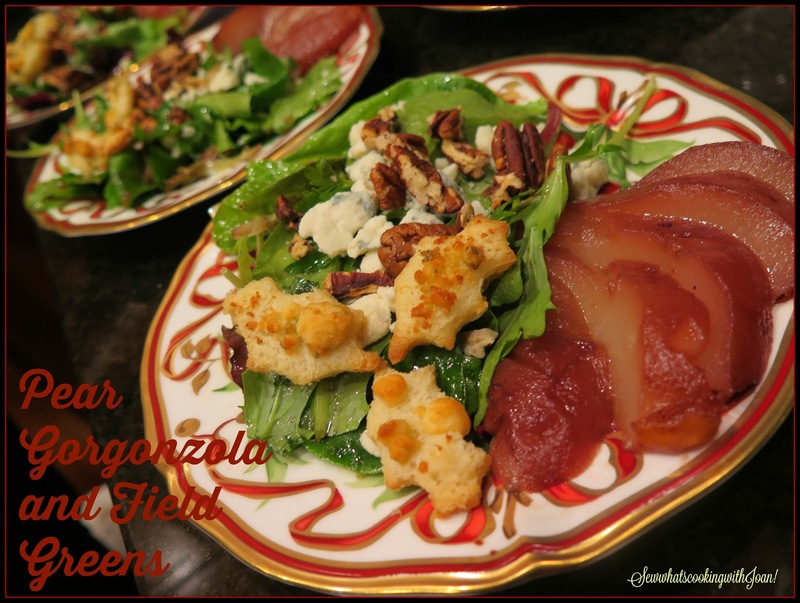 : Field greens, pear and gorgonzola salad! Our family favorite! Field greens, pear and gorgonzola salad! 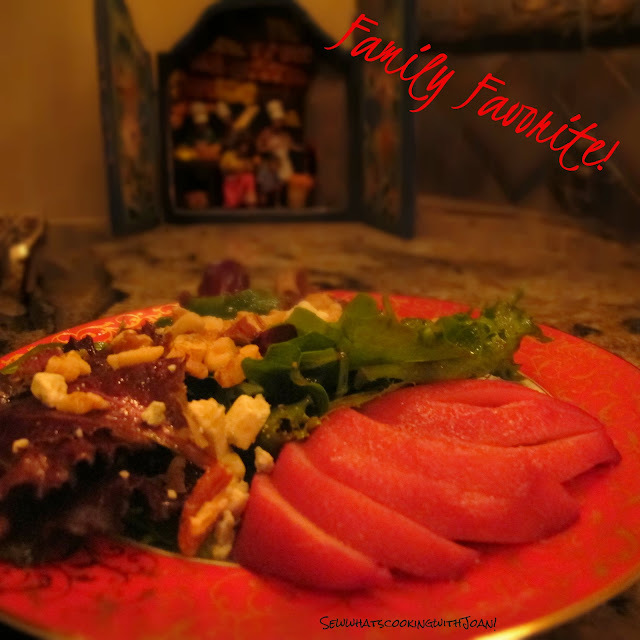 Our family favorite! Thanksgiving is upon us and some of you may be panicking about everything that has to get done. I know, I’ve been there. I am notorious for making too many dishes and driving myself crazy trying to figure out how to get them all done. Thank goodness this year, my amazing daughter-in-law and son are hosting Thanksgiving and my equally amazing daughter and son-in-law are hosting Christmas day! I handed the Holiday baton over last year at a Thanksgiving celebration at our home in Scottsdale. Wee Bear and I didn't know what their reaction would be, but, they thrilled us with an overwhelming, "YES"! I told them I would assist and be there in every way, from setting the tables to menu planning, serving drinks, cooking, baking and clean up. But... they have embraced it, and are really having fun!! It has been a smooth transition, no drama, happiness and laughter abound! And no, we didn't stuff the turkey with Prozak!! A few last minute tips to remember. These days there are a lot more people with dietary restrictions and it is likely you will have to accommodate some at your holiday dinner. Make sure you ask all of your guests ahead of time. If you are unable to fulfill their needs, ask them to bring something that they can eat. If you have vegetarians coming, make sure you offer them something other than just the side dishes. I like to stuff a acorn squash with truffle risotto (October 31, 2012 blog) or something similar so that they feel just as special as everyone else at the table. When you are figuring out the seating arrangements, make sure you place quiet people next to those who are great conversationalists. If you have a couple of joke tellers in the crowd, place them at opposite ends of the table or room. In our family, Wee Bear is the best conversationalist, I used to say, "he could carry on a conversation with a telephone pole"! If you have especially shy people coming, make sure you tell the people on either side of them some of their favorite topics or hobbies so they can keep the conversation going throughout dinner. If you have people who are not comfortable with each other, do not put them next to each other.....could be awkward for them. If you are going to serve the meal family-style with dishes being passed at the table, keep your centerpiece and table decorations to a minimum. You don’t want your guests to have to peer around a towering flower arrangement, or juggle dishes to find room on the table. Go out into the yard and pick up some fallen leaves and acorns and scatter them around the table. Add a few votive candles (helps reduce the danger of fire), some beautiful plates, glasses and napkins, and you have the makings of a stunning holiday table. Amy's table is set and I had the pleasure of seeing it early, (actually I was offering to buy the flowers) it has the most stunning deer horn candelabras, napkins and rings ...needs nothing in addition. They are ROCK STARS! And TT has created a time line for preparations, he is in charge of turkey brining to cooking, mashed potatoes and cranberry sauce. Another fun idea for the table is to create fun place cards that double as take home gifts. Small potted plants with the names written on the side, a bag of homemade candies or baked goods, or even bags of caramel corn labeled are all fun, inexpensive, and thoughtful ways to say thank you to your guests for joining in the holiday celebration. Here is a family favorite salad, it is gorgeous and heavenly! Peel pears, cut in half, remove core and stem with a melon baller. 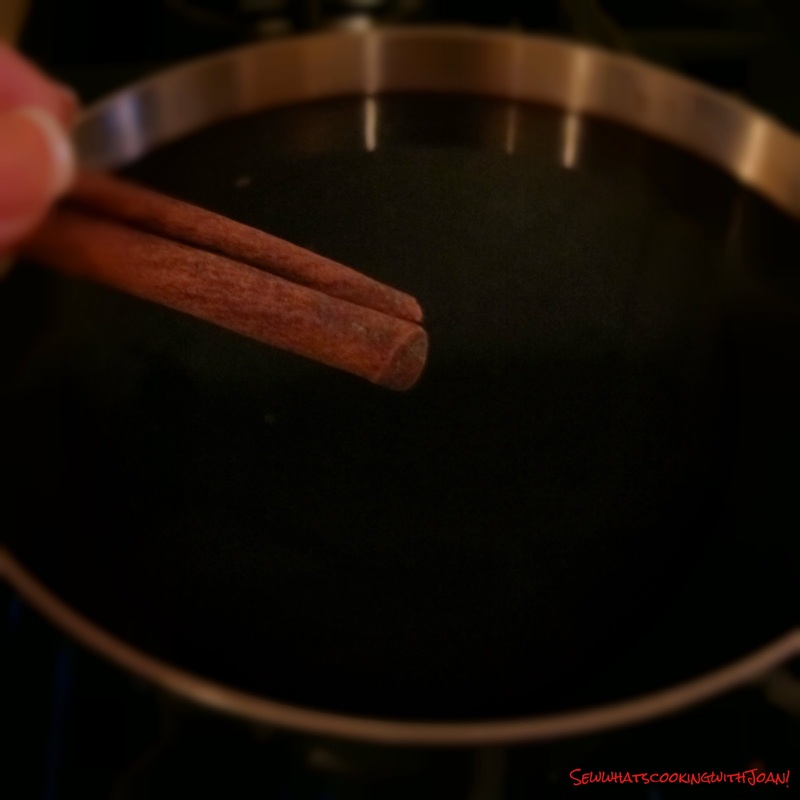 Combine the wine, Port, orange juice, sugar and cinnamon stick in a large saucepan. Bring to a boil and stir until sugar dissolves. 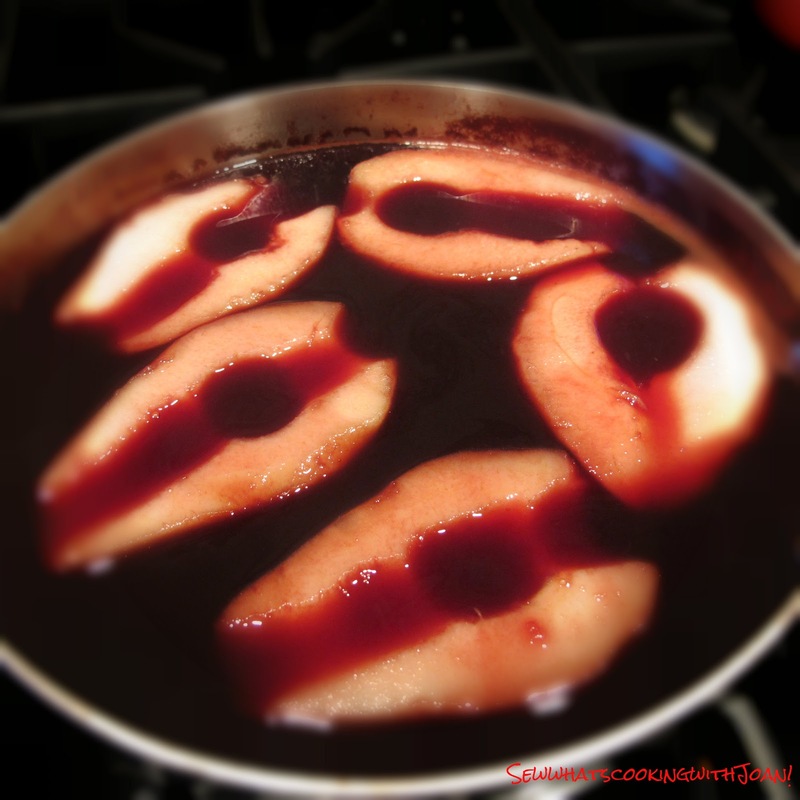 Place pears into the poaching liquid, cut side down, and reduce heat to a simmer. Cook about 20 minutes, turning pears after 10 minutes. 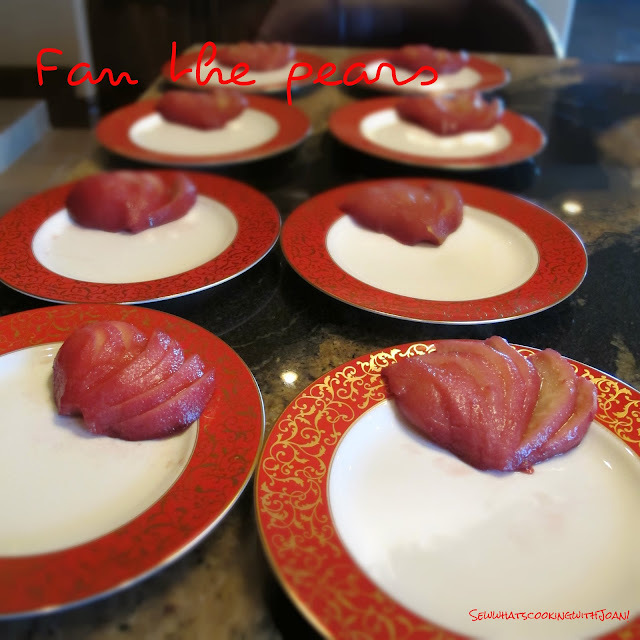 Slice the pear not all the way through on a diagonal several time and push it gently into a fan on each plate, refrigerate the plates. Reduce poaching liquid to 1 1/4 cups. 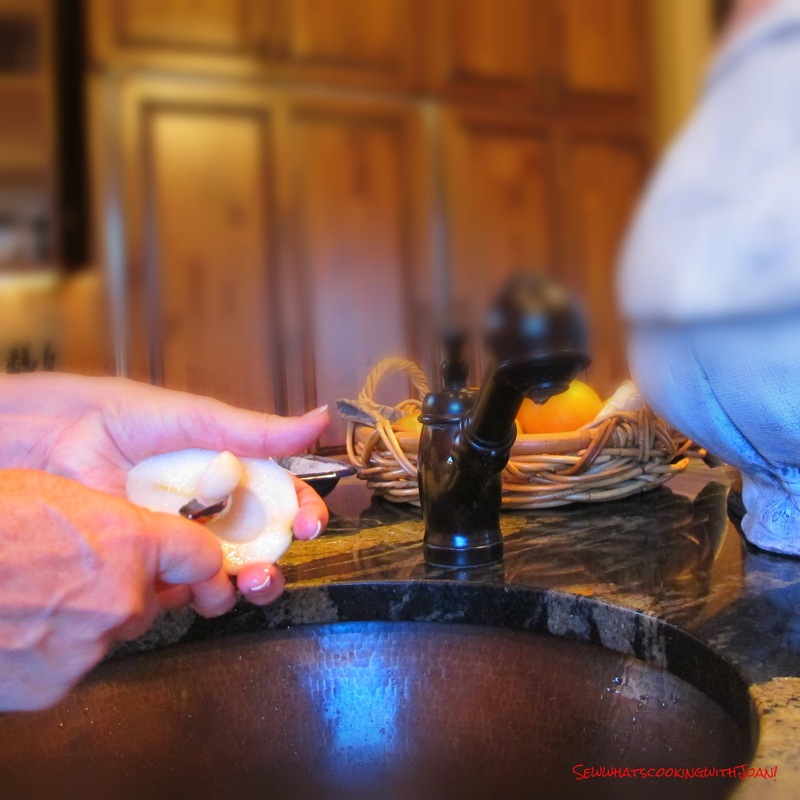 Whisk the oil and vinegar together to blend. Add shallots, salt and pepper and Gorgonzola. Whisk until almost smooth, then whisk in the poaching liquid. The poaching liquid is key here and really makes this dressing. Toss the field greens with vinaigrette and arrange on cold prepared salad plates. Garnish with the nuts, cheese and croutons. Cut tiny shapes out of stale bread. It can be little hearts, triangles, leaves or anything. Brush with butter sprinkle with Gorgonzola an bake in a 350 F oven for 10 minutes until crispy. 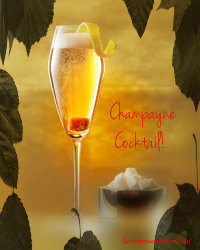 To start your guests off I am offering a oldie but goodie, that I adapted to my favorite celebration drink! And we have plenty to be thankful for and celebrate this holiday!! This is one of the few original cocktails that appeared in the first (1862) version of the seminal How to Mix Drinks by Jerry Thomas. The recipe has remained unchanged for 150 years. I adapted to my favorite Veauve Clicquot! Salute'! Celebrated in the United States on the fourth Thursday of November, and in Canada on the second Monday of October, Thanksgiving is observed by both countries as a day to give thanks to God for the food on our tables and for the family and friends we know and love. Each country has its own history of the first Thanksgiving, but both traditions involve the giving of thanks for a bountiful harvest at harvest time; thus, the varying dates for Thanksgiving celebrations, as harvest time differs between Canada and the US. Regardless of which country in the world we are from, there are so many things to be thankful for. We should think of all that we have, whether large or small, tangible or intangible, and be grateful for those things; and above all, remember to count our blessings and thank God, not just once a year, but each and every day. Sweet One and I are thankful that we have joined your families dinner this Thanksgiving, whether it be an idea, or a dish. We have so much to be thankful for. If you have any questions, e-mail me on Google at jjmessenger60@gmail.com. I will check periodically for any issues, whether it be one of our recipes, a craft or any other recipe, feel free to ask. Our family has designed a week full of activities. Already we have had a family dinner at our families favorite Italian restaurant, we also went to the movies together and tonight is "Thanksgiving Trivia" night arranged by our son-in-law at a local restaurant. Wee Bear and I have been boning up on trivia. I will give you three questions to have fun at your families dinner. Answers at end of blog! 1) According to Butterball, how long do you thaw a wrapped turkey per 4 pounds,in the refrigerator? 2) Butterball says, that once the turkey is done, you should let it rest for 15 minutes, why? 3) In Canada, they celebrate Thanksgiving in which month? Tomorrow, Wee Bear and I are excited to join Sweet One and TT along with many other family members including our adorable granddaughter Emma, my 92 year old Mother, Mountain Man(my brother), and his grandson! We are so excited! On Saturday, Mountain Man's daughter arranged a full family bowling day!! So fun! Hoping you have a warm and wonderful Thanksgiving Holiday!